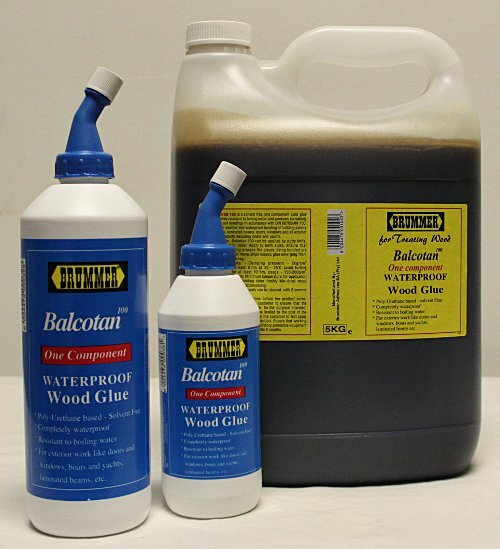 BALCOTAN 100 is a one part polyurethane based waterproof wood glue. Unlike the PVA Cold Glue which is only water resistant, BALCOTAN 100 is completely waterproof. It also has tremendous gap filling properties. BALCOTAN 100 is not affected by UV or any other outside elements. Bonds may be permanently submerged under water. Apply to both sides of the surfaces and to be clamped overnight. Use Brummer Cleaner 19 to wipe away any excess product. All cleaning should be done before the product hardens. Do not dilute BALCOTAN 100 with Brummer Cleaner 19. Wear gloves to protect hands while using the adhesive. LAMINATED BUTCHERS BLOCKS AND ALSO ANY APPLICATION WHERE PRODUCT WILL BE CONTINUOUSLY EXPOSED TO MOISTURE.